Invest Openly: Value Investing Code - The Warren Buffett Way : A FREE Udemy Course That Worth Your Time! 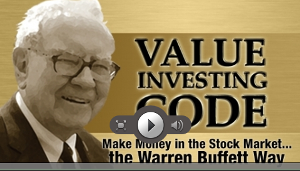 Value Investing Code - The Warren Buffett Way : A FREE Udemy Course That Worth Your Time! I am a proponent of life-long learning. Chinese we have a saying "活到老，学到老" (continue learning till we are old). Thus, it is important for all of us to keep learning and expanding our horizon. With the launch of MOOC (Massive Open Online Courses) platform like Coursera and Udemy, learning can me immediate, online and free (most of the time). Recently, I've registered for the Udemy platform and a completed a FREE course called "Value Investing Code - Make Money In The Stock Market The Warren Buffett Way". The knowledge and information shared in this course is massive and I've never learned so much from an free online course before. In fact, it is only after completed this online course that triggering me to set-up this personal blog to document my share investing journey. Hope you like my sharing.